American Currents has gone to the printers! I just wanted to let everyone know that the American Currents proof copy has passed final muster and the printer should be starting to print copies today for distribution. I'm told that it'll take about 5 days for them to print all of the copies, and then they will be mailed after that. So you should expect a copy at your door in about 2 weeks! 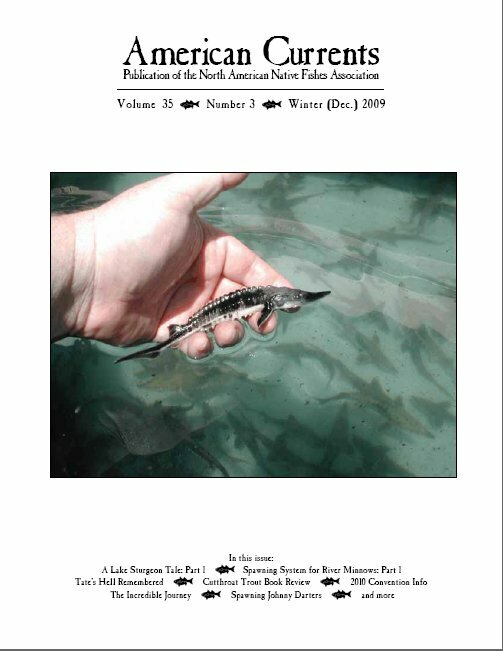 In this issue, you'll find articles about Lake Sturgeon, a spawning system for river minnows, a 2009 convention collecting trip recap, a Cutthroat Trout book review, 2010 convention info, an American Eel article, an article about spawning Johnny Darters, and more! I hope that you enjoy it! Please feel free to send me comments about it. I'm trying to make it the best publication it can be. Now, all of that said, I ask you to please send along any content you may have for future issues. Some of the articles that are coming out in the current AC have second-halves that will be making an appearance in my second issue, but I still need more content. Also, please be aware that we're trying to get out six issues this year, so I'm going to need a lot of material to fill them! I appreciate any help you can provide. If you have anything to send along, please send it to my email address below. Thanks! Brian, you're awesome! Thanks so much for taking this on! Brian, thank you for or new issue. Beautiful Brian! Will be looking forward to the read. What a beautiful photo. Looks spectacular. Thanks, guys! I hope that you enjoy it! Please feel free to send me comments after you get the issue. I'll be interested in your feedback. Also, again, if you have any content for a future AC, please send it to me. I've got a lot of issues to fill this year. Thanks! Admit it - the cover of this issue is strictly intended to tease Moon! And it's a good issue, with not one but two articles involving Casper doing his thing from Florida to Wisconsin (but he only wrote one of them). Gonna turn in a little early tonight with a fresh copy of AC to read and make some flowing water dreams. Looks like it's the Snorkelmeister issue! Awesome job Brian, I sincerely appreciate you taking on this task! Thanks again, guys! All of the membership should have their copies in the next week or two. Please feel free to leave comments for me here after reading it, or send me an email. My contact info is below. Thanks! I just realized I need to update my mailing address. Where do I accomplish this daring feat? Not this week but next week I am thinking of joing NANFA solely for American Currents. Are there any online in PDF format so I can preview it to decide if it is what I want to do? Thou doest well, my son! Got mine, Brian, you've done a fantastic job. Thanks a lot for all your hard work! Contact Tom Watson to update your mailing address. His email is: onefish2fish@comcast.net. For those of you looking for a sample issue of the AC to whet your appetite, please visit this page and follow the link to the Spring 2005 Issue PDF on the right-hand side of the page. Enjoy!